Detectives are holding two suspects believed to be part of a car theft syndicate operating in Nairobi and its environs. 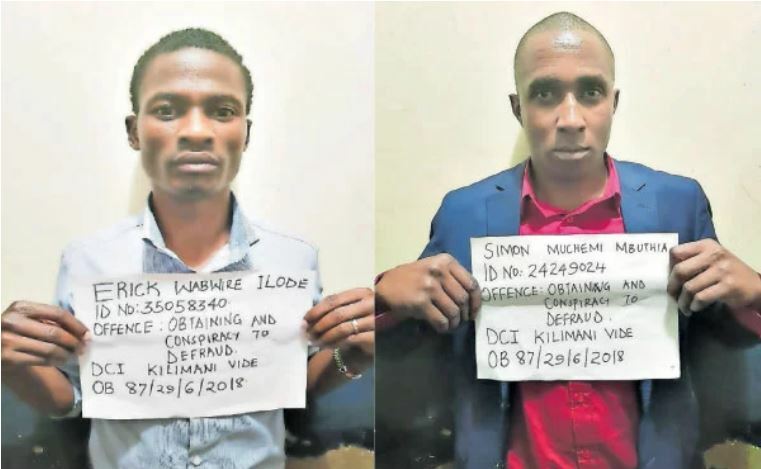 The suspects, Eric Wabwire Illode, 27 and a former Kenya Wildlife Service officer, Simon Muchemi Mbuthia, 30, were nabbed on Friday after falling to a trap set as early as Tuesday last week. The Nation reports that on Tuesday, undercover detectives from the Kilimani Police Station sent Sh50,000 to conmen purporting to be selling cars. Posing as customers, the detectives had been directed to deposit the money as a commitment fee for the purchase of a Toyota Harrier. The deposit was to set the ball rolling on delivering the SUV from Mombasa to Nairobi. After sending the commitment fee, the detectives – male and female, and the suspects agreed to meet them at a show-room along Kiambu Road, where the arrest was made. Kilimani OCPD, Michael Muchiri said: “They were arrested at the showroom along Kiambu Road. An identification parade by the victims identified the two as the men who conned them. They are then said to switch off their phones or tell their victims blatantly that they are conmen and that they should be careful next time they are purchasing cars. The suspects reportedly admitted that they registered their mobile numbers using Identity Cards they collected from the streets, and which belong to people they have never even met. The police have cautioned Kenyans to only pay money to the dealers themselves, and once they are sure that the product they are purchasing exists.